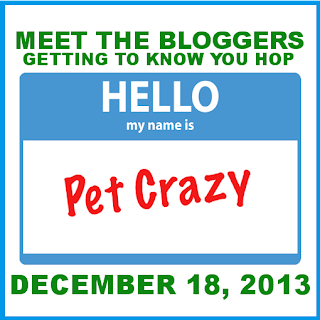 So here's a fun little tidbit I've been meaning to share since I attended the BlogPaws conference in May. I was standing, er, kneeling there petting Ricochet from NEPA Pets while his owner Dawn talked to Jodi from Kol's Notes and none of us recognized each other. It wasn't until Jodi Stone from Heart Like a Dog came by and recognized me that we all realized we actually "knew" each other, we just didn't recognize the human faces. Truth: If you are a pet blogger and I meet you and your dog on the street, I will undoubtedly recognize your dog. I will probably know his/her name, their favorite toy, date of birth and pet peeves but I will probably not know your name. This is true of most interactions at dog parks today so maybe not all that unusual. The big difference is, unlike if I met you at the dog park, if you're a blogger and we bump into each other one day, I probably won't even recognize your face. Recently, I've been privy to some conversations lately where a remarkable number of pet bloggers I know have all come to realize we spend a lot more time behind the camera than in front of it. This was not always true for me. When I was growing up, my dad was an aspiring photographer always in need of a subject. And what better subject than your kid who has to do what you say because, well, they're your kid. I grew up in front of a camera. But what I most remember from these photo-journalistic outings was the time I spent alone with my dad. We would go to parks and hike through the woods or climb on the rocks along the Rhode Island coast. Just me and him. And a camera. And then, when I got the first dog of my adulthood, Beau, my dad came up with this great idea to take a picture of me and Beau together pretty much in the same pose every month for the first year of Beau's life. 14 years later when I had to help my big beautiful boy cross over The Bridge, those photos were a treasure I could never have expected. And I admit, when I look at those photos, I don't just see how unspeakably cute Beau was as a puppy. I see me in them as well. A younger me who was just beginning to find her way in the world. I see the adoration in my eyes for my chubby, wiggly puppy. And I see the early formation of a bond that grew to be unlike any other in my life. Now that my father has passed on as well, I can't help but wish someone had had the forethought to take pictures of me and him every year while I was growing up. Because, while there are dozens of pictures of me growing up, there are only a few of me with my dad. There are even fewer of me and Bella since my dad hasn't been here to take them. I need to figure out how to take more pictures of me and Bella together. I'm hardly invisible on the blog - I'm in plenty of videos and all the old photos I share that my dad took. But there aren't any pictures that put me and Bella together and I plan to change that. I have two weeks to figure out how. Why do I only have two weeks? 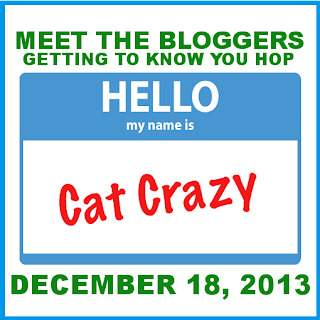 Because, on December 18th, a bunch of bloggers are hosting a "Meet the Blogger" Blog Hop and you're invited. Here's all you need to do to join in the fun. Once you publish your post, join the Hop by adding your post to the Linky that will open the 18th (you can find the Linky code at the bottom of this post). Then have fun hopping around getting to know all the bloggers behind your favorite the blogs just as we'll be getting to know you better. That's all there is to it. If you plan to participate, grab the badge that fits you best, post it on your blog and tell your friends. Then, we'll meet you back here on the 18th. In other news: Today's "Advent Calendar for Dog Lovers" giveaway is sponsored by Wags and Wiggles on Etsy. You could win adorable handcrafted accessories for you & your dog. Today's giveaway is sponsored by Wags and Wiggles. You could win adorable handcrafted accessories for you & your dog. Click here to check out the Advent Calendar and enter today's giveaway. This sounds great! Can't wait for it. and I look forward to seeing what you come up with. Oh Leslie, you got me misty. What a touching story. If I wasn't committed to participating before, that would have done it! There are a few. In complete honesty? I think there are 4. Eek. And yes, that needs to change. While I adore any picture of her, the pictures I have of me and Beau capture our relationship. And my relationship with Bella, while special to me, is one of only two relationships she has in the entirety of her life. It should be documented. Thanks Pamela. I have to admit, with it being right in the middle of the holiday season, this post had me a little 'misty' too. Oh sweetie, Mommy's not lazy, she's just going through a really, REALLY rough time. I know she's relying on you to help her through these holidays. We would love to have her join but I know how hard it is to just get out of bed some days. We love you all and think of you often. So excited to have you on board. I agree. It's about time we 'discover' the blogger behind the blog! Love the idea of the monthly photos with you and Beau - what a wonderful idea. I treasure the photos my dad took of me with all of our dogs.